A few weeks ago, we put out a post just prior to The Europas, the big award show for European startups. We mentioned NextStories briefly in our listing of the nominees from this region, but as the winner in the category of “Best Central and Eastern Europe Startup”, it’s really worth doing a more in-depth post now. Even before winning its recent award, NextStories managed to garner some really nice attention by receiving a mention in The New York Times. Currently in beta, NextStories is described as a never-ending newspaper. It’s sort of a re-imagining of the reading experience in that users come to the site, read an article, and are then fed a number of related articles for further reading. This startup’s site does not require registration, but does require the installation of a bookmarklet in the toolbar of the user’s browser. Having read a news or blog article, users can click on the bookmarklet and be presented with a number of articles, based on relevance to the just-read piece, that they might be interested in reading next. At the moment, NextStories says that there are more than 2,000 U.S. news sites and blogs in its database, but the recommendations appear to be mainstream news. I had a chance to ask Ondrej Bobal, the founder of NextStories about the company and its plans and he told me that there’s quite a bit in the works. In terms of footprint, I’m told that they are working to provide content in German, Czech, Polish, and Russian. Online content may not be limited, in most cases, by borders, but there are definitely still language barriers and providing content in a greater number of languages should help NextStories to widen their base. In terms of funding, Bobal says that they’ve backed themselves to this point and directed me to the Steps2Next site. Finally, from a development standpoint, iOS seems to be current focus. Bobal says that they’re working to develop an iPad app and will only later think about producing something for Android or Windows. When I asked about the company’s current userbase, he made it clear that they believe that tablets are the future and that beginning to market the product and developing a tablet app will be important for the service to grow in popularity. The team at Steps2Next has been working web since 1997, so they’ve been at this for quite awhile. Their initial creation, auto.cz, was acquired by Axel Springer AG in 2007, so they’re now moving on to their next challenge. In addition to NextStories, they’re also developing Talkino, a comment platform which we first wrote about a couple of months ago. In using Android, I have tried a number of magazine-style newsreader apps like Flipboard, NewsRepublic, Prismatic and Google Currents, but the app that I thought of when reading about NextStories was News360. News360, which is actually based in both California and Moscow and is managed by a Russian team, is a mobile app which enables users to create an account and read stories by categories that the user selects. The user can fill his or her feed with relevant stories by signing in with Google, Facebook, or Twitter accounts, but what’s key here is the app learns about what the reader likes as more stories stories are read. Prismatic works in a similar way but has a cleaner user interface, allows to add sources manually (and has GoalEurope included as a publisher included). The fact that NextStories is a bookmarklet and not an app is a key difference between it and all of the magazine-style apps out there. 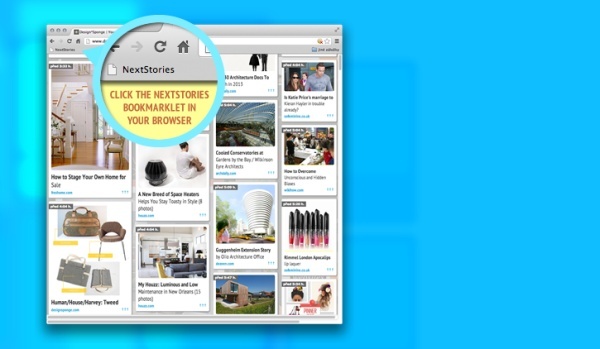 While the others are specifically geared towards mobile devices, NextStories seems to be more of a cross-platform tool. There may not an app for this service, but the NextStories website offers instructions for installing the bookmarklet on iPads and iPhones for the mobile web users.